Madame Saqui, or Marguerite-Antoinette Lalanne (1786-1866) made her name in her native France as a tightrope walker and rope dancer. 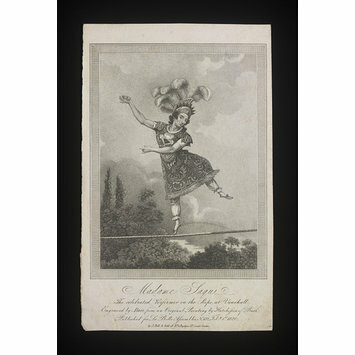 In April 1816 her performance at Covent Garden Theatre descending a tightrope stretched at an incline over the auditorium, made her name in England and became the subject for a cartoon by George Cruikshank entitled 'A Wonderfull (sic) Thing from Paris, or Madame Sacchi Gratifying John Bull's Curiosity'. 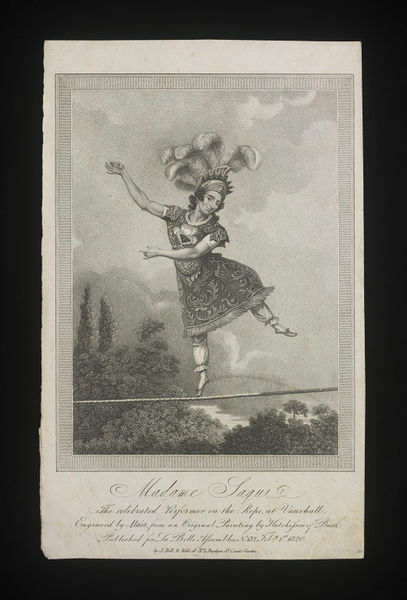 George Rogers Barratt and Jonathan Tyers Barrett, the proprietors of Vauxhall Pleasure Gardens, subsequently engaged her there for four years, where her hugely popular act act included her descent at a run, on an inclined tightrope stretched from a mast, to one of the main walkways, in a storm of exploding fireworks.